hen I was six years old, I asked my dad to bring me some snow on a trip back from London. might be flagged as some illegal substance that gets me locked up in the next country. I have prized souvenirs, too, like an antique, bohemian, Morocan coffee set that I snagged from the owner of some hole-in-the-wall restaurant that I convinced to sell to me. My box of Ethiopian coffee beans was stolen from the table in my hotel room by a colobus monkey who proceeded to jeer at me from the top of a baobab tree all afternoon. I recently got spiced tea combos from a Zanzibari spice farm, mixes like cardamom-mango-and-lemongrass. All these purchases consciously made by me yet I don’t even like tea or coffee. Food can make for great souvenirs too, and some of my favourites to receive have been Swiss chocolates, Turkish baklava and dates from Oman. Ever notice, though, how much easier it is to splurge on overpriced goods when you’re paying in foreign currency? My most-recent purchase comes from the streets of Stone Town which we traveled to for this issue. I spotted various gentlemen playing a heated game of Bao on the streets and bought a set that’s been sitting on my coffee table for three weeks now - I am yet to even Google how to play it. For you, however, souvenirs come by way of all the exciting stories and photographs shared in this issue. 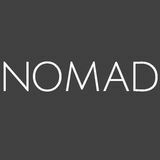 wattaonthego NOMAD ISSUE. 17 · APRIL/MAY 2019 · PUBLISHED BY WEBSIMBA LIMITED, ALL RIGHTS RESERVED. 12 12. 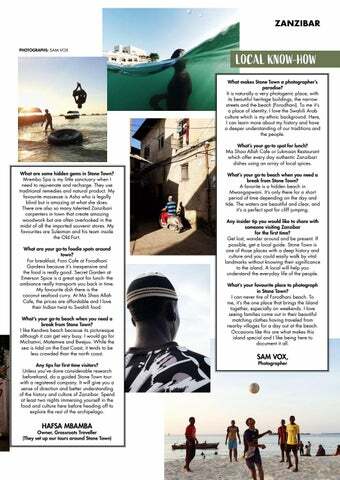 TOP SHOTS This month’s featured photographers capture a striking sunset in the wild and a charismatic gentleman in Lamu’s Old Town. 18. NEWS Africa’s largest ferris wheel is launched at Two Rivers mall, an Ethiopian Airlines flight crashes shortly after take off and a wildfire rages through Mt Kenya. 20. WHATS ON From a wine extravaganza to this year’s Rhino Charge, find a round-up of must-attend events this season. 9. GET TO KNOW: NAI NAMI Who better to show one the streets of downtown Nairobi than the kids who used to live in those very streets and had to have their smarts about them to survive? 22. GLOBETROTTERS Underwater photographer Jahawi Bertolii talks about his time spent diving into the depths of the ocean in Sri Lanka to document marine life with the aim of shedding a light on their conservation. 54. WHAT I PACK FOR MY TRAVELS Biko Adema is a renowned rugby sevens player who’s traveled the world and stolen the hearts of numerous sports fans in the process. Take a peek inside his carry-on bag for items he likes to bring on trips. 30. 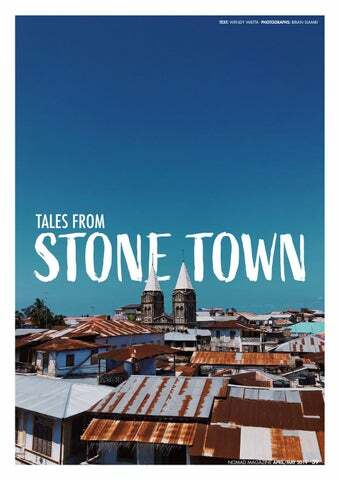 TALES OF STONE TOWN Get lost with us in the maze-like streets of this charming historic town. Find everything you need to plan for your visit, from insights from our recent trip to secret insider know-how. 36. 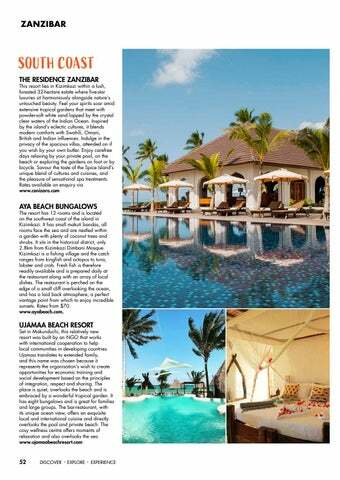 ISLAND IDYLL Said to be Zanzibarâ&#x20AC;&#x2122;s most-popular beach, Nungwi is always abuzz, understandably so. 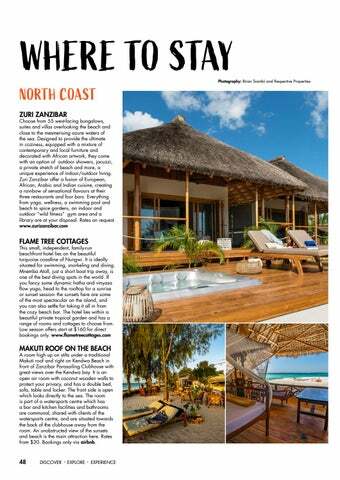 In between its beach strip with the array of hotels, read all about a favourite find, Kilindi Zanzibar, coupled with a parasailing adventure crowned by swimming with turtles. 40. 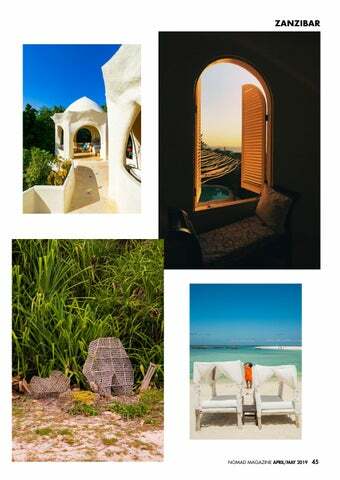 WHERE TO STAY From North to South and East to West, a round-up of places to stay whatever the beach youâ&#x20AC;&#x2122;re looking to explore. 46. 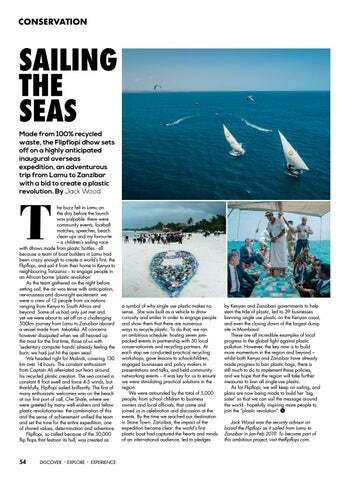 SPOTLIGHT ON: FLIP FLOPI The Flipflopi dhow sets off on a highly anticipated overseas expedition sailing from Lamu to Zanzibar with a bid to create a plastic revolution. 48. 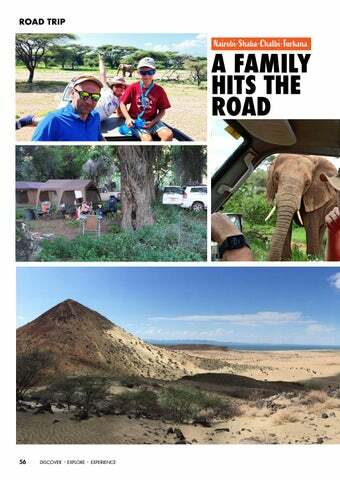 ROAD TRIPS: A FAMILY HITS THE ROAD Exploring ideas of where to go, Simon Marsh decides that a road trip up North, well beyond the usual tourist trail, might be a fun and unique way to spend a couple of weeks with his family. 52. 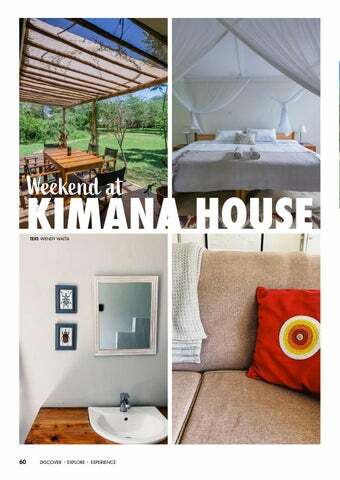 SPOTLIGHT: KIMANA HOUSE Wandering around the beautiful, now-renovated four rooms of Kimana House, it is hard to believe that at the turn of 2018, it was still a dark and dreary space with ghastly tinted windows and a questionable choice of paint. 52 REGULARS 25. 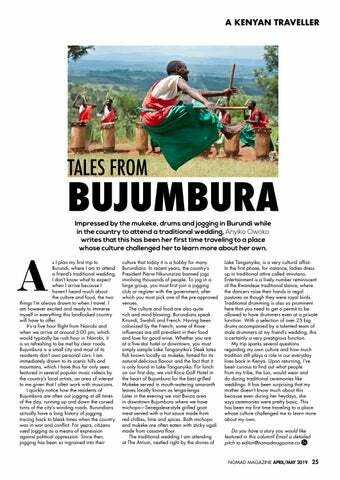 KENYAN TRAVELER Impressed by the mukeke, drums and jogging in Burundi, Anyiko Owoko writes that this has been her first time traveling to a place whose culture challenged her to learn more about her own. 28. 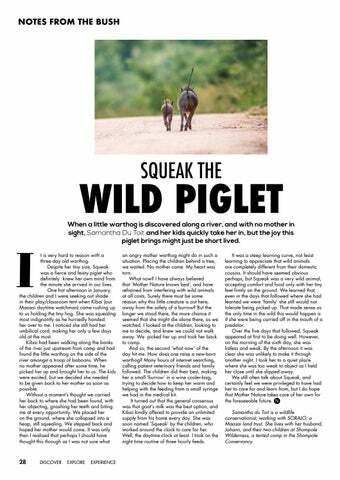 NOTES FROM THE BUSH When a little warthog is discovered along a river, and with no mother in sight, Samantha Du Toit and her kids quickly take her in, but the joy this piglet brings might just be short lived. 50. 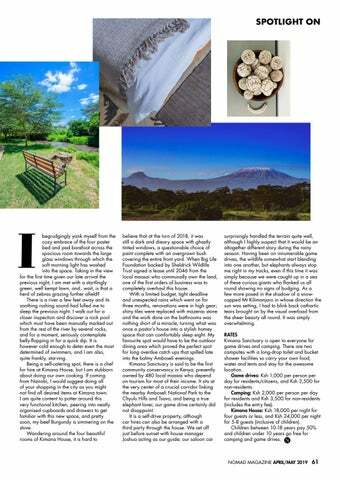 BUDGET PICK: ROCKY ECO LODGE Most travel-loving Nairobians are no strangers to Naivasha, a place which, at the very least, has served as a pit-stop as you leave or drive back to the capital. In this town, Leroy Buliro finds a spot perfect for anyone traveling on a tight budget. 56. 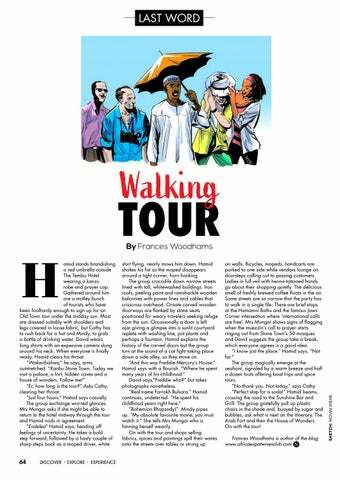 LAST WORD:WALKING TOUR Hamid takes visitors on a four hour walking tour of Stone Town, but will they really brave the heat for that long? As a child my family loved picnics, and I can name many a shady tree where we stopped en route to a safari destination to have our egg sandwiches and coffee. But when asked to name a favourite non-picnic spot it would have to be the balcony of Nautilus Restaurant on Kilifi Creek. Set up on stilts, not much can surpass eating fresh tuna carpaccio with a cold glass of white wine while watching dhows sail by. Nothing beats digging into some really good food while in a serene atmosphere that truly calms the mind. We had just finished exploring the amazing Tsavo East National Park and while driving along the coast, made a stop at Osteria Restaurant, right by the ocean’s shores in Malindi. That warm ocean breeze accompanied by a classic cheesy Italian pizza was hands down the highlight of the journey. I always look forward to visiting Kobe in Watamu; it has a unique mixture of great ocean views, a laid back vibe and outstanding cuisine with a seafood focus. Large prawns with garlic are cooked to perfection and accompanied by tender calamari and the catch of the day, which just melts onto the fork. I like to combine with a glass of chilled pinot grigio and some finely chopped chillies, and the result is euphoric! NICK DALE Instagram: @nickdalephotography There was a beautiful sunset and I took this shot using the settings: ISO 280, f/16 and 1/500. The most important factor for me when shooting this was the aperture as I wanted both the silhouette and sun to be sharp. I used a Nikon D850 and an 800mm lens perched on top of the bonnet of a safari truck! TIP: When taking this type of shot, it is important to keep the horizon very low in the frame. SUSAN MOLLOY Instagram: @whatsusansees As I walked through Lamu Townâ&#x20AC;&#x2122;s maze of alleyways and artistic doorways, meeting this charismatic gentlemen was one of my favourite moments. He welcomed me to chat with him in the shade for a while. Realistically, it was mostly us laughing at my terrible Swahili before I asked if I could take a few portraits. For me, this shot represents the beauty of an unhurried life lived in this friendly, coastal community. I took this shot with a Canon 5d Mark III and a Canon 24-70 mm F/2.8 lens. BRIAN SIAMBI Instagram: @brian.siambi There was a beautiful morning light as we were driving out of Kimana Sanctuary at 7:00am. It was the clearest day to see Mt. Kilimanjaro so I got out of the car and started capturing it. A few metres away, we saw some commotion and dust in the air, and driving a little further on, encountered a herd of elephants. This curious female stood and looked straight at us and I quickly grabbed my camera and got it in frame with the mountain in the background. The birds were a lucky occurence in the shot Shot with the Sony A7 and 70-200mm at F7.1, ISO 160, and 1/320. TIP: Always have your camera on standby when in the wild. Nature is quick and you wonâ&#x20AC;&#x2122;t always have a second chance to capture an image. AFRICA’S LARGEST FERRIS WHEEL LAUNCHED AT TWO RIVERS MALL This observation wheel dubbed “Eye of Kenya” is set to give one brilliant panoramic views of Nairobi’s expansive skyline. It is located at Two Rivers Mall along Limuru Road and boasts 40 air-conditioned cabins that have a seat capacity of six passengers each. The Eye of Kenya is the tallest ferris wheel in Africa at 60m above ground, surpassing the Cape Wheel in South Africa which stands at 40m. Get to enjoy this iconic addition to the city’s attractions by paying Ksh 500 per person. The wheel does two revolutions which take a total of 14 minutes. ETHIOPIAN AIRLINES PLANE CRASHES SHORTLY AFTER TAKE OFF This devastating crash happened six minutes after take off, leaving no survivors when the Ethiopian Airlines Boeing 737 MAX 8 plane crashed while on its way from Bole International Airport in Ethiopia to Kenya’s Capital, Nairobi. Investigations into the cause of the accident are still on-going as several countries suspend the Boeing 737 MAX 8 planes. The aircraft was carrying 149 passengers from at least 35 nationalities as well as eight crew members. Another plane of the same model was involved in a crash less than five months ago when a Lion Air flight crashed into the sea near Indonesia with nearly 190 people on board. WILDFIRE DEVASTATION IN MT. KENYA A multi-agency team successfully managed to put out a fire in Mt Kenya Forest. The week-long wildfire destroyed approximately 120,000 hectares of vegetation and killed wildlife. Mt Kenya region is an important water catchment area for Kenya and also hosts national parks and various conservancies. The inferno that reportedly started near Lake Ellis in Tharaka-Nithi County spread to parts of Embu, Laikipia and Kirinyaga counties. The Kenya Forest Service boss said investigations were underway to establish the cause of the fire but they were not ruling out poachers, illegal honey harvesters and bhang farmers as some of the possible causes. A big thank you to the environment and forests ministries, Kenya Defence Forces, British Army Training Unit, Tropic Air, Mt Kenya Trust, Kisima Farm, Lewa Conservancy, Sheldrick Wildlife Trust and the Rhino Ark for battling and successfully putting out the huge wildfires. SOKOKE FOREST MTB CHALLENGE This biking safari initiative is geared towards conservation of the exotic Arabuko Sokoke Forest in Watamu, Kilifi County. The race stands to offer a perfect blend of challenge and thrilling adventure... the picturesque sights and sounds are just a bonus. A 70 km challenge will take place on 4th May while a 15 km fun day will be held on 5th May. A great deal of cash prizes will be up for grabs. For more information and registration details, check out SOKOKE MTB CHALLENGE on Facebook. RHINO CHARGE 2019 The Rhino Charge is an annual off-road 4×4 competition held in Kenya to raise funds to support the activities of the Rhino Ark Kenya Charitable Trust, an NGO which works towards the conservation and protection of Kenya’s mountain range ecosystems. This year’s event takes place from 30th May to 2nd June. Tickets are only available from the Rhino charge website ticketing portal (www.rhino-charge.org), which closes on 24th May. General location details will be shared by the Clerk of Course during the pre-event briefing on 4th May 2019. The exact location will be revealed to registered ticket holders the night before the event; the venue is usually kept a secret. WINE EXTRAVAGANZA The second edition of the Wine and Beer Extravaganza will be held on Saturday April 6, 2019 at the Leleshwa Getaway in Rongai from 11:00 am till late. The Wine tasting affair presents you with an opportunity to sample over 50 wines, champagnes and gourmet food while also undergoing wine training and jamming to live DJ music. Build your wine knowledge and enjoy your glass, all while overlooking the Nairobi National Park. Entry is free. For more details, contact 0722 528 749. UNDERWORLD Kenyan-Italian photographer Jahawi Bertolii talks to Nomad’s Leroy Buliro about his time spent diving into the depths of the ocean to document marine life with the aim of shedding a light on their conservation. not the best weather for photography. The whales were close to the coastline and when we found them, we realised that the boat was surrounded by at least 15 feasting blue whales; even with all their years of experience, the crew had never seen so many together! We spent some time just watching them to see their behaviour and once the captain was convinced it was safe, I decided to take the plunge. How was the first dive? The water was very murky and visibility was poor. Swimming on, I came across a bubble trail left by one of the whales that had a 6 metre wide tail. Water visibility was bad and it was impossible to get a good shot. The water was 1 km deep and 500 metres long, cargo ships were moving silently through the mist... not the best conditions, so we called it a day and went back to shore deciding to wait a few more days for better conditions. This was actually one of the only times I’ve ever felt really uneasy in the water. Did you get another photo opportunity? Definitely. We spent the next week exploring the southern part of the island and when conditions improved, headed back out to the open ocean again. From radio chatters, we heard that the whales were quite far off the coast - about 30 nautical miles - so we motored out into the blue which took about 3 hours. We eventually found one as the sun was getting low. The best way to get a chance to capture these gentle giants is to get in the water in front of them and let them swim to you. There were many unfruitful attempts. Knowing we had a long trip home, the captain said there was one more chance to get underwater. I jumped and swam as fast as I could to reach where I estimated the whale was heading only to see a huge tail disappear into the blue, for a moment I thought I had missed my opportunity and then I turned to see another whale coming straight at me following the first! ocean, and that moment will stay with me forever. What lies next for you this year? I just received great news that a project I’ve been working on has been approved for a National Geographic Society grant, which is amazing and pretty much a dream come true! This will be part of a larger project we’re setting up called East African Ocean Explorers where we want to inspire a new generation of explorers who will champion marine conservation and act as an inspiration to young people in their communities. We want to provide a platform for passionate people to be able to explore and learn more about the ocean providing workshops, educational films and funding for young Kenyans from coastal communities to be able to get in the ocean; whether that’s learning how to snorkel, taking a diving course or going on whale watching trips. Includes B&B, 1hr of stand up paddle/kayak rental per person per day; bicycle rental and steam room use. an angry mother warthog might do in such a situation. Placing the children behind a tree, we waited. No mother came. My heart was torn. What now? I have always believed that ‘Mother Nature knows best’, and have refrained from interfering with wild animals at all costs. Surely there must be some reason why this little creature is out here, away from the safety of a burrow? But the longer we stood there, the more chance it seemed that she might die alone there, as we watched. I looked at the children, looking to me to decide, and knew we could not walk away. We picked her up and took her back to camp. And so, the second ‘what now’ of the day hit me. How does one raise a new-born warthog? Many hours of internet searching, calling patient veterinary friends and family followed. The children did their best, making her a small ‘burrow’ in a wine cooler-bag, trying to decide how to keep her warm and helping with the feeding from a small syringe we had in the medical kit. It turned out that the general consensus was that goat’s milk was the best option, and Kibai kindly offered to provide an unlimited supply from his home every day. She was soon named ‘Squeak’ by the children, who worked around the clock to care for her. Well, the daytime clock at least. I took on the night time routine of three hourly feeds. It was a steep learning curve, not least learning to appreciate that wild animals are completely different from their domestic cousins. It should have seemed obvious perhaps, but Squeak was a very wild animal, accepting comfort and food only with her tiny feet firmly on the ground. We learned that, even in the days that followed where she had learned we were ‘family’ she still would not tolerate being picked up. That made sense as the only time in the wild this would happen is if she were being carried off in the mouth of a predator. Over the five days that followed, Squeak appeared at first to be doing well. However, on the morning of the sixth day, she was listless and weak. By the afternoon it was clear she was unlikely to make it through another night. I took her to a quiet place where she was too weak to object as I held her close until she slipped away. We still often talk about Squeak, and certainly feel we were privileged to have had her to care for and learn from, but I do hope that Mother Nature takes care of her own for the foreseeable future. Samantha du Toit is a wildlife conservationist, working with SORALO, a Maasai land trust. She lives with her husband, Johann, and their two children at Shompole Wilderness, a tented camp in the Shompole Conservancy. 30TH - 31ST MARCH 2019 Great beer, food and company were all the rage at â&#x20AC;&#x2DC;The White Cap Big Brunchâ&#x20AC;&#x2122; event which took place in Diani on the 21st & 22nd March. Restaurant managers, influencers & the White Cap team were all in attendance for the adventure filled brunch part of the White Cap Big Brunch series, all of which led to the Big Brunch weekend on the 30th & 31st of March, courtesy of Kenya Breweries Limited and Eatout Kenya. With some of the best restaurants in Nairobi & Mombasa participating, the weekend was filled with beer, laughs and brunch. If you missed out, have no fear: More adventures and brunch weekends are coming your way soon! Go In A Group sure, a romantic brunch could be a thing, but we believe that brunch is an experience for friends. grab your crew and make it a special day! Let the Sweet & Savoury Combine the best thing about brunch is how it’s a common ground for both. relish in it, it’s one of the few times you can! chicken wings with honey covered pancakes? yes! Enjoy Your White Cap COMPLETE YOUR BRUNCH WITH AN ICE- COLD WHITE CAP LAGER, PERFECT FOR WASHING DOWN ALL THAT DELICIOUSNESS. Leave A Review your review will definitely help others figure out where they should go so please, leave a review! Tip Well brunch can be a crazy time for servers, so show a little appreciation and tip well! e are standing outside the Old Fort when Taib, with suspicious enthusiasm, launches into a colourful story about an Arab princess called Salme. Suspicious, because how someone can be so chipper in this heat is beyond me; I can already feel a migraine start to throb within the crevices of my brain thanks to the sun mercilessly hammering at it. As he drones on, pausing ever so slightly to adjust his kofia, I momentarily halt my frantic self-fanning antics as I am gently transported to a Stone Town of 1866, when this fort upon whose walls I now lean would have been used as a garrison and prison. Merchants, I imagine, would have been haggling about the price of a kilo of cloves, a teenage slave hopelessly marching behind his brother towards an uncertain tomorrow, an adventurer setting foot on ‘zinj-bar’ soil for the first time fresh off the boat from a faraway land, and for Princess Salme, utterly scared of the whispers in the palace and her brother the Sultan’s reaction to finding out that she was pregnant by their German neighbour. Shortly after, she flees this homeland having been rejected by her people for her choice in a lover. Once in Hamburg, her name is no longer Salme but Emily Ruete, and while she gets baptised as a christian, she secretly dreads going to church and adamantly refuses to eat pork. Through this woman’s story, 19th century Stone Town fascinates me because of how different the society and culture are from present day. I wonder what life would have been like for me, an African woman. Despite being born into vast wealth, the youngest of a Sultan’s thirty children, Salme still has to secretly teach herself how to write because this skill is not taught to women. Imagine, then, the policing of friends, fashion, marriage, entertainment, work and the works. I am drawn out of my reverie by a cat - these lanky felines that slink proudly along the verandahs, and when you come face to face, it is you that has to move out of the way. This being my second visit to Stone Town, hiring Taib to take us on a walking tour was a smart idea. My first visit, I’m afraid, was wasted, because I mostly wandered around the streets overwhelmed by the beauty with no real insight into the rich history. Much like Lamu Old Town, the pathways are narrow and maze-like, lined with curio shops and art dealers, and after a couple of turns, start to blend into one another in their similarity. Brightly coloured scooters whizz past. Women swathed in colourful kangas or beautiful buibuis gracefully sashay along with handwoven baskets in hand. Gentlemen perched on barazas play a complex board game of bao, the winner clapping animatedly and talking smack to his opponent, and I am so intrigued I that I buy a set. Distinguishing between the beautiful intricately carved Arab and Indian doors, some pastel and others with shiny golden brass studs, becomes a fun pastime. If a place ever so deserved to be called charming, it would be this town. I fall in love with its very essence, African, Arab, Indian, Persian and European influences distinct in everything from the people to the mosques, churches, bazaars, architecture and food. Stone Town is picture perfect, the heat notwithstanding. We were actually lost when we first wandered onto this street where four of the town’s winding alleys intersect, but we stayed for the people watching. It is hard to miss, distinguished by a large painting-on-the-wall of the poster of that classic 1975 Steven Spielberg movie. Here, a mzee brews strong, black, Arabic-style coffee in steel kettles balanced precariously over a small charcoal stove. The beverage is cheap and flows almost as freely as the gossip, and there is a high chance you will be roped into a debate about anything from football to the weather. Should you wish to call your online lover living somewhere in Sweden or Thailand, there is a long pole with an old phone and a cheeky sign announcing “free international calls”. We may have only been in Stone Town for two nights but we stopped by this spot so much - at first to find solace from the heat but pretty soon like a pair of hopeless crackheads in need of a fix - that we were on a first name basis with the waitress. The walls are decked in photos from around town and the refreshing gelatos are made from real fruit. Local flavours include coconut, tamarind, hibiscus, passion and baobab. They were so addictive, in fact, that I walked from my hotel room in pajamas at 10:00pm to go get a scoop; a pathetic sight, I am certain, but my taste buds were quite pleased. This is a glorious seafront night market bustling with tourists and locals alike, with numerous vendors selling local dishes all being cooked on the spot. The seafood is oh so seductively spread out, but because it’s not always refrigerated, to try these would be to set a date with food poisoning. You should however definitely try Zanzibar pizza, and Mr Mango’s stand is the place to go. To be honest, his signature mango-nutella combo is more like a crepe than a pizza, but it sure is downright delicious. To his left, a vendor sells freshly squeezed sugar cane juice to wash down your food with, and if you’re still hungry, because you’re a glutton, a lady to his right sells a spicy Zanzibar mix also known as urojo. We were told that this market is a tourist trap since the same food is much cheaper at Darajani, but I liked the vibe so much I didn’t mind the snare. If you’re here before sunset, entertainment will be by way of local boys diving from the perimeter wall into the sea below. This modern upscale bar and restaurant is said to have some of the best sunset views, but both times I’ve been there have unfortunately been after dark. 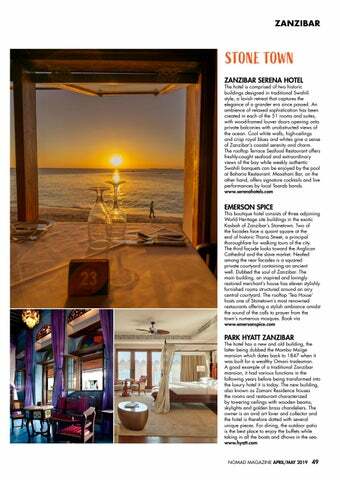 It has a multicultural millennial staff and the menu offers an array of excellent gin-based cocktails infused with Zanzibar’s popular spices. On this visit, we sat on the outdoor terrace - the best spot in the house - where there was remix to the Game of Thrones theme song playing. Some local guys were playing a lively game of football on the sand below and after two ginpassion-and-saffron cocktails, I had to be held back to stop me from joining. Herbs and spices were initially introduced to Zanzibar by Portuguese traders from their colonies in India and South America in the 16th century. During the Omani rule, cloves were actually more valuable than their weight in gold. We drove for a little over 10km from the town center to an organic farm where we learnt how the spices got to the island, how they are grown as well as their uses, some of which we had never considered before. We were smelling, tasting and collecting spices like cloves, lemongrass, garlic, ginger, cinnamon, turmeric, vanilla, pepper, cardamom and more. I love using spices in my kitchen...cooking without any is like hosting a party with no music. I have only ever seen some of them ground, which made the tour all the more interesting. Fresh whole nutmeg for instance opens up like a jewellery box and the seed sits inside like an exotic ring, and I was just about to say yes to this unexpected marriage proposal until our guide told us that the spice is actually “like a viagra for women”, at which I very slowly backed away. It was only 10:00am for heaven’s sake. At the end of the tour we came to a stand selling packaged spices and soaps as well as interesting spiced tea combinations. We loaded up by the kilos. LOCAL KNOW-HOW What makes Stone Town a photographer’s paradise? It is naturally a very photogenic place, with its beautiful heritage buildings, the narrow streets and the beach (Forodhani). To me it’s a place of identity. I love the Swahili Arab culture which is my ethnic background. Here, I can learn more about my history and have a deeper understanding of our traditions and the people. What’s your go-to spot for lunch? Ma Shaa Allah Cafe or Lukmaan Restaurant which offer every day authentic Zanzibari dishes using an array of local spices. 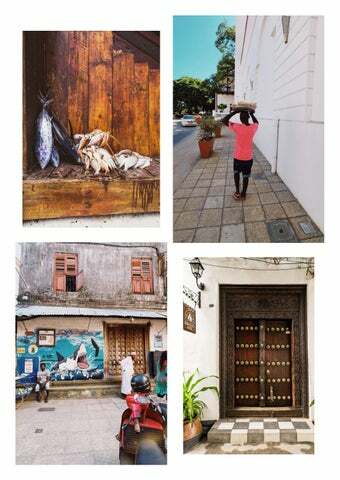 What are some hidden gems in Stone Town? Mrembo Spa is my little sanctuary when I need to rejuvenate and recharge. They use traditional remedies and natural product. My favourite masseuse is Asha who is legally blind but is amazing at what she does. There are also so many talented Zanzibari carpenters in town that create amazing woodwork but are often overlooked in the midst of all the imported souvenir stores. My favourites are Suleiman and his team inside the Old Fort. What are your go-to foodie spots around town? For breakfast, Foro Cafe at Forodhani Gardens because it’s inexpensive and the food is really good. Secret Garden at Emerson Spice is a great spot for lunch- the ambiance really transports you back in time. My favourite dish there is the coconut seafood curry. At Ma Shaa Allah Cafe, the prices are affordable and I love their Indian twist to Swahili food. What’s your go-to beach when you need a break from Stone Town? I like Kendwa beach because its picturesque although it can get very busy. I would go for Michamvi, Matemwe and Bwejuu. While the sea is tidal on the East Coast, it tends to be less crowded than the north coast. Any tips for first time visitors? Unless you’ve done considerable research beforehand, do a guided Stone Town tour with a registered company. It will give you a sense of direction and better understanding of the history and culture of Zanzibar. Spend at least two nights immersing yourself in the food and culture here before heading off to explore the rest of the archipelago. What’s your go-to beach when you need a break from Stone Town? A favorite is a hidden beach in Mwangapwani. It’s only there for a short period of time depending on the day and tide. The waters are beautiful and clear, and it’s a perfect spot for cliff jumping. 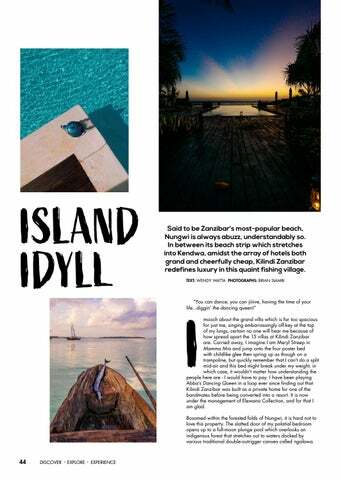 Any insider tip you would like to share with someone visiting Zanzibar for the first time? Get lost, wander around and be present. If possible, get a local guide. Stone Town is one of those places with a deep history and culture and you could easily walk by vital landmarks without knowing their significance to the island. A local will help you understand the everyday life of the people. What’s your favourite place to photograph in Stone Town? I can never tire of Forodhani beach. To me, it’s the one place that brings the Island together, especially on weekends. I love seeing families come out in their beautiful matching clothes having traveled from nearby villages for a day out at the beach. Occasions like this are what makes this island special and I like being here to document it all. mooch about the grand villa which is far too spacious for just me, singing embarrassingly off-key at the top of my lungs, certain no one will hear me because of how spread apart the 15 villas at Kilindi Zanzibar are. Carried away, I imagine I am Meryl Streep in Mamma Mia and jump onto the four poster bed with childlike glee then spring up as though on a trampoline, but quickly remember that I can’t do a split mid-air and this bed might break under my weight, in which case, it wouldn’t matter how understanding the people here are - I would have to pay. I have been playing Abba’s Dancing Queen in a loop ever since finding out that Kilindi Zanzibar was built as a private home for one of the bandmates before being converted into a resort. It is now under the management of Elewana Collection, and for that I am glad. Bosomed within the forested folds of Nungwi, it is hard not to love this property. The slatted door of my palatial bedroom opens up to a full-moon plunge pool which overlooks an indigenous forest that stretches out to waters docked by various traditional double-outrigger canoes called ngalawa. Here, you can wear a bikini and laze by the beach all day and yet a monkey might swing by your room from the bush to say hello, and I like that juxtaposition. ZANZIBAR Here, you can wear a bikini and laze by the beach all day and yet a monkey might swing by your room from the bush to say hello, and I like that juxtaposition. The white-washed pavilions are very European; Scandinavian minimalism meets the curved roofs of Santorini’s domes complete with bougainvillea flowers in full bloom along the pathways. The bathroom housed in its own building comes with a rainshower and sink-with-a-view, and is big enough to host a small conference. As I potter between this and my room, clothes quickly become burdensome. Keen to seek refuge from the heat after every trip from the beach, my only predicament is whether to use the fan or let trade winds do the cooling. Guests are assigned their very own butler and we get Victoria who comes with heaps of the renowned Swahili hospitality and a side of wit. Dinner on the first night is right by the T-shaped pool, and just when we thought things couldn’t possibly get better than that, on the second night, we get our own secluded spot by the beach. The meals here are absolutely divine. Ugali is elevated way above its pay grade in an amuse bouche that mashes in potatoes and tops that off with a flavour-packed beetroot puree. The seafood is fresh and whispery with local spices, and Victoria always seems to appear with a drink as soon as you think about one (she does this throughout our stay, and I am completely convinced that she’s a mind reader). After dinner, a guard pushes the pan with the log fire even closer to the water and Victoria brings out bean bags to snuggle in. Looking out at the stars and the sea glimmering in the shadows, if an experience ever so deserved to be called magical, this would be it. Conversation wanes as we drift in and out of slumber before everyone retreats to their villas at 1:00pm. If we had no activities planned for the following day, we would have been content to sleep on this beach till the morning. In fact, I have now decided that Kilindi is where I will be coming for my honeymoon. I suppose I still need to meet the guy first, but let’s not get caught up on the minor details. Along with Kendwa, the fishing village of Nungwi is said to be Zanzibar’s most-popular beach, understandably so. The water is such a saturated turquoise that should you only see it in a postcard, you would think it were fake. It is also perfect for swimming in whatever the time; there are no tides. The sunsets are spectacular enough to turn even the most articulate poet into a baby-talking goop. The shoreline is always docked by dhows and if you visit in the morning, you can always chat up the fishermen for tales from the sea. It is idyllic living, and we were warned that it would be crowded, if only because numerous hotels occupy the same stretch of beach from Nungwi to Kendwa. The only place where we saw a lot of people was however at the latter beach which has gained a reputation as the home of epic full moon parties. other water sports are offered here. The vibe back at their dive center is so lively that I could have hung out with this community for the rest of the afternoon, but that cold hibiscus cocktail at Kilindi wasn’t going to drink itself. I have been so eager to swim with these turtles all afternoon, but now, finally face to face with them while crouching at the entrance to this tidal pond watching them paddle hard in a race to reach the food which has just been thrown in by one of the attendants, I am unexpectedly timid. First of all, their number is overwhelming. I can spot at least 15 of all sizes and ages. After a little coaxing from Nomad’s photographer Brian, who has himself settled on paying only the $7 required to simply watch and feed them (it costs $10 to swim with them), I decide to take a deep breath and walk into the cold water. Eager to feed on the seagrass which has just been thrown in and perhaps a little keen to play as well, the turtles come rushing towards me and I can suddenly feel their flippers and shells rubbing against my skin under the water as they swim about. I find their touch ticklish and can’t help but laugh and squeal every time they brush against me. Once I get comfortable, however, there is no getting me out. Looking at these gentle creatures, it is hard to imagine them being caught in fishermen’s nets which is how a lot of them often die, or being hunted for their meat. Places like Baraka Natural Aquarium exist to provide a refuge for rescued turtles and are often involved in research, conservation and re-release into the sea. We are the only guests at the pond and I would thereby suggest visiting later in the day after the crowds have wandered off. 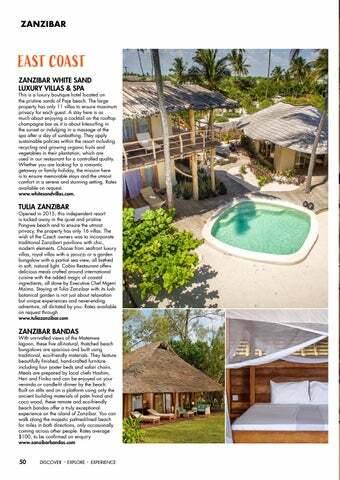 A room high up on stilts under a traditional Makuti roof and right on Kendwa Beach in front of Zanzibar Parasailing Clubhouse with great views over the Kendwa bay. It is an open air room with coconut wooden walls to protect your privacy, and has a double bed, sofa, table and locker. The front side is open which looks directly to the sea. The room is part of a watersports centre which has a bar and kitchen facilities and bathrooms are communal, shared with clients of the watersports centre, and are situated towards the back of the clubhouse away from the room. An unobstructed view of the sunsets and beach is the main attraction here. Rates from $30. Bookings only via airbnb. This is a luxury boutique hotel located on the pristine sands of Paje beach. The large property has only 11 villas to ensure maximum privacy for each guest. A stay here is as much about enjoying a cocktail on the rooftop champagne bar as it is about kitesurfing in the sunset or indulging in a massage at the spa after a day of sunbathing. They apply sustainable policies within the resort including recycling and growing organic fruits and vegetables in their plantation, which are used in our restaurant for a controlled quality. Whether you are looking for a romantic getaway or family holiday, the mission here is to ensure memorable stays and the utmost comfort in a serene and stunning setting. Rates available on request. www.whitesandvillas.com. The resort has 12 rooms and is located on the southwest coast of the island in Kizimkazi. It has small makuti bandas, all rooms face the sea and are nestled within a garden with plenty of coconut trees and shrubs. It sits in the historical district, only 2.8km from Kizimkazi Dimbani Mosque. Kizimkazi is a fishing village and the catch ranges from kingfish and octopus to tuna, lobster and crab. Fresh fish is therefore readily available and is prepared daily at the restaurant along with an array of local dishes. The restaurant is perched on the edge of a small cliff overlooking the ocean, and has a laid back atmosphere, a perfect vantage point from which to enjoy incredible sunsets. Rates from $70. www.ayabeach.com. by Kenyan and Zanzibari governments to help stem the tide of plastic, led to 39 businesses banning single use plastic on the Kenyan coast, and even the closing down of the largest dump site in Mombasa! These are all incredible examples of local progress in the global fight against plastic pollution. However, the key now is to build more momentum in the region and beyond – whilst both Kenya and Zanzibar have already made progress to ban plastic bags, there is still much to do to implement these policies, and we hope that the region will take further measures to ban all single-use plastic. As for Flipflopi, we will keep on sailing, and plans are now being made to build her ‘big sister’ so that we can sail the message around the world - hopefully inspiring more people to join the “plastic revolution”. Jack Wood was the security advisor on board the Flipflopi as it sailed from Lamu to Zanzibar in Jan-Feb 2019. To become part of this ambitious project, visit theflipflopi.com. ur trip was to take us from Nairobi up to Shaba National Reserve, which is contiguous with the considerably more famous Samburu and Buffalo Springs National Reserves, before heading off to the eastern side of Lake Turkana and crossing over into the Chalbi desert, all while revelling in the places in between. We had spent a lot of time seeking out individuals with knowledge of the more remote areas and bombarding them with questions. The given answers provided more questions than answers; we would need to carry between one and sixty litres of spare fuel, might get no punctures or upwards of twenty, water might be available or we might need to filter our own...the only certainty was that there were many uncertainties. Our first stop was Shaba, previously home to Joy Adamson. Shaba has a tropical feel to it thanks to the Ewaso Nyiro river dissecting it. We pitched camp at the Funan campsite. As expected, there were no facilities but it did offer shade under sprawling Acacia trees, with plenty of water from the spring and a small stream. The kids and I mucked in with a will and soon a small hamlet emerged. With the long drop dug and the mess tent set up, the priority was to get the fire prepared. At any African camp the fire is both the oven and the social hub and will generally be kept going all the time. With plenty of firewood, this was relatively easy and the next priority was to open the fridge for cold drinks all round. The next couple of days were spent pottering around, watching elephants and gerenuk, looking for crocodiles in the swiftly flowing river water and paying a visit to the Save the Elephant Research Camp in neighbouring Samburu reserve to learn about their critical work before cooling off in the refreshing natural spring pool in Buffalo Springs. The children also discovered the delights of wallowing in the marsh and seeing how much mud it was possible to accumulate upon themselves. 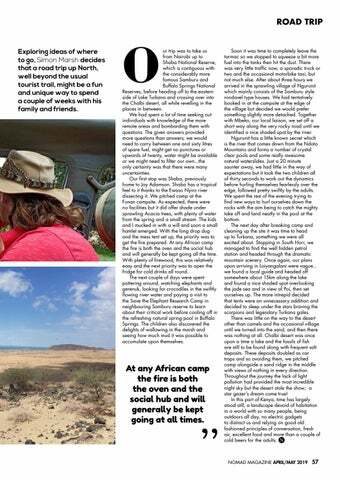 At any African camp the fire is both the oven and the social hub and will generally be kept going at all times. Soon it was time to completely leave the tarmac so we stopped to squeeze a bit more fuel into the tanks then hit the dust. There was very little traffic now, a sporadic truck or two and the occasional motorbike taxi, but not much else. After about three hours we arrived in the sprawling village of Ngurunit which mainly consists of the Samburu style rondavel type houses. We had tentatively booked in at the campsite at the edge of the village but decided we would prefer something slightly more detached. Together with Mbeko, our local liaison, we set off a short way along the very rocky road until we identified a nice shaded spot by the river. Ngurunit has a little known secret which is the river that comes down from the Ndoto Mountains and forms a number of crystal clear pools and some really awesome natural waterslides. Just a 20 minute saunter away, we had little in the way of expectations but it took the two children all of thirty seconds to work out the dynamics before hurling themselves fearlessly over the edge, followed pretty swiftly by the adults. We spent the rest of the evening trying to find new ways to hurl ourselves down the rocks with the aim being to catch the mighty take off and land neatly in the pool at the bottom. The next day after breaking camp and cleaning up the site it was time to head up to Turkana, something we were all excited about. Stopping in South Horr, we managed to find the well hidden petrol station and headed through the dramatic mountain scenery. Once again, our plans upon arriving in Loiyangalani were vague... we found a local guide and headed off somewhere about 15km along the lake and found a nice shaded spot overlooking the jade sea and in view of Poi, then set ourselves up. The more intrepid decided that tents were an unnecessary addition and decided to sleep under the stars braving the scorpions and legendary Turkana gales. There was little on the way to the desert other than camels and the occasional village until we turned into the sand, and then there was nothing at all. Chalbi desert was once upon a time a lake and the fossils of fish are still to be found along with frequent salt deposits. These deposits doubled as car traps and so avoiding them, we pitched camp alongside a sand ridge in the middle with views of nothing in every direction. Throughout the journey the lack of light pollution had provided the most incredible night sky but the desert stole the show; a star gazerâ&#x20AC;&#x2122;s dream come true! In this part of Kenya, time has largely stood still, a landscape devoid of habitation in a world with so many people, being outdoors all day, no electric gadgets to distract us and relying on good old fashioned principles of conversation, fresh air, excellent food and more than a couple of cold beers for the adults. surprisingly handled the terrain quite well, although I highly suspect that it would be an altogether different story during the rainy season. Having been on innumerable game drives, the wildlife somewhat start blending into one another, but elephants always stop me right in my tracks, even if this time it was simply because we were caught up in a sea of these curious giants who flanked us all round showing no signs of budging. As a few more posed in the shadow of a snowcapped Mt Kilimanjaro in whose direction the sun was setting, I had to blink back cathartic tears brought on by the visual overload from the sheer beauty all round. It was simply overwhelming. RATES Kimana Sanctuary is open to everyone for game drives and camping. There are two campsites with a long-drop toilet and bucket shower facilities so carry your own food, water and tents and stay for the awesome location. Game drives: Ksh 1,000 per person per day for residents/citizens, and Ksh 2,500 for non-residents. Camping: Ksh 2,000 per person per day for residents and Ksh 3,500 for non-residents (includes the entry fee). Kimana House: Ksh 18,000 per night for four guests or less, and Ksh 24,000 per night for 5-8 guests (inclusive of children). Children between 10-18 years pay 50% and children under 10 years go free for camping and game drives. THE RULES OF PEOPLE BY RICHARD TEMPLAR I like to bring a motivational book to go through whenever I can and this current read is marketed as a personal code for getting the best from everyone... it promises to turn you into a natural ‘people person’, so we’ll see about that. BLOC SUNGLASSES I like to whip these out when it gets too sunny or when I simply want to enjoy a beautiful view such as an incredible sunset. They are also just oh so stylish! PORTABLE JBL SPEAKER This has proved to be the perfect companion on roadtrips. When on group getaways with friends at the beach or on safari, we can simply play some good music and hang out. The sound quality is superb. G SHOCK WATCH BY CASIO This is perfect if you’re on the move a lot as it was designed for sports and adventurous outdoor activities. From the gym to hiking and the beach, you can literally wear it anywhere. A SMALL BIBLE A quiet moment of devotion and meditation is key every now and then. For my spiritual nourishment, I’ll go through this and it calms, inspires and sharpens my focus. is Kenya’s premier airline with a network of connecting domestic scheduled services to all the best safari destinations within Kenya and across the border into Tanzania. Based at Wilson Airport, Nairobi, Safarilink provides daily scheduled flights to Maasai Mara, Amboseli, Tsavo West, Naivasha, Nanyuki, Lewa Downs, Samburu, Lamu, Kilimanjaro, Loisaba, Kitale, Kapese, Lodwar, Migori, Vipingo, Diani, Zanzibar and Kisumu. 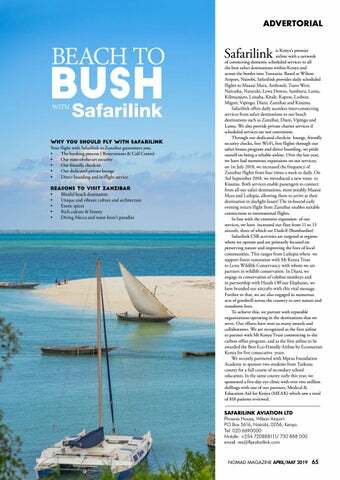 Safarilink offers daily seamless inter-connecting services from safari destinations to our beach destinations such as Zanzibar, Diani, Vipingo and Lamu. We also provide private charter services if scheduled services are not convenient. Through our dedicated check-in lounge, friendly security checks, free Wi-Fi, free flights through our safari bonus program and direct boarding, we pride ourself on being a reliable airline. Over the last year, we have had numerous expansions on our services; on 1st July 2018, we increased the frequency of Zanzibar flights from four times a week to daily. On 3rd September 2018, we introduced a new route to Kisumu. Both services enable passengers to connect from all our safari destinations, most notably Maasai Mara and Laikipia, allowing them to arrive at their destination in daylight hours! The in-bound early evening return flight from Zanzibar enables suitable connections to international flights. In line with the extensive expansion of our services, we have increased our fleet from 11 to 13 aircraft, three of which are Dash-8 (Bombardier) Safarilink CSR activities are targeted at regions where we operate and are primarily focused on preserving nature and improving the lives of local communities. This ranges from Laikipia where we support forest restoration with Mt Kenya Trust to Lewa Wildlife Conservancy with whom we are partners in wildlife conservation. In Diani, we engage in conservation of colobus monkeys and in partnership with Hands Off our Elephants, we have branded our aircrafts with this vital message. Further to that, we are also engaged in numerous acts of goodwill across the country to save nature and transform lives. To achieve this, we partner with reputable organizations operating in the destinations that we serve. Our efforts have won us many awards and collaborators. We are recognized as the first airline to partner with Mt Kenya Trust committing to the carbon offset program, and as the first airline to be awarded the Best Eco-Friendly Airline by Ecotourism Kenya for five consecutive years. We recently partnered with Mpesa Foundation Academy to sponsor two students from Turkana county for a full course of secondary school education. In the same county early this year, we sponsored a five-day eye clinic with over two million shillings with one of our partners, Medical & Education Aid for Kenya (MEAK) which saw a total of 818 patients reviewed. Most travel-loving Nairobians are no strangers to Naivasha, a place which, at the very least, has served as a pit-stop as you leave or drive back to the capital. It is also home to numerous affordable accommodation spots and activities, making it the perfect stop for budget travellers. 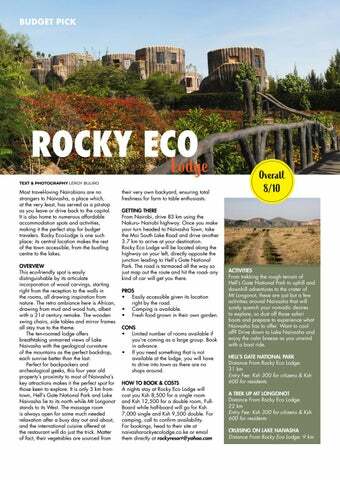 Rocky Eco-Lodge is one such place; its central location makes the rest of the town accessible, from the bustling centre to the lakes. 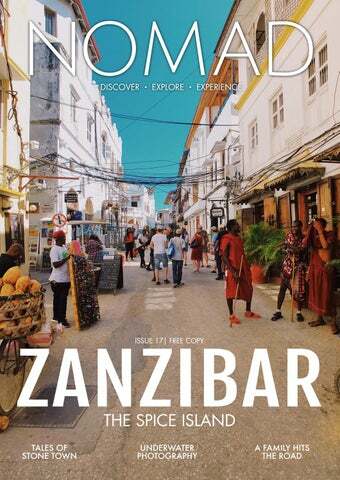 Get lost with us in the maze-like streets of Zanzibar's charming and historic Stone Town.